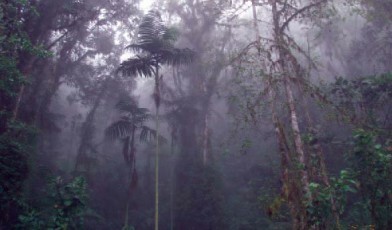 Tropical montane forests are one of the major global conservation priorities due to their biological richness, high level of endemism and because data availability in this region is still comparatively limited. This joint project with the Centre for Conservation Ecology and Environmental Change at Bournemouth University is assessing the impact of climate change on the montane tree species of the Andes and undertaking conservation assessments. Tropical montane forests are threatened by habitat degradation and destruction caused by logging, fuelwood collection, farming and mining. Climate change is adding to these pressures, as montane tree species are particularly vulnerable to changes in temperature and rainfall. Loss of these forests could lead to changes in soil stability, reduce water availability for lowland areas and negatively impact on the other ecosystem services . This project aims to produce conservation assessments of a wide range of threatened montane tree species and analyse the potential impacts of climate change under different future scenarios. In 2010 a workshop took place in Ecuador to review the conservation of montane tree species of the Northern Andes region and to assess priorities for conservation action. In collaboration with the IUCN/SSC Global Trees Specialist Group (GTSG), the project is working towards producing a detailed IUCN Red List assessment of the trees of the Andean montane forests. Progress has already been made towards this end, with conservation assessments added to the IUCN Species Information Service (SIS) for review and the publication of assessments expected shortly. The information collected will be extremely valuable in planning conservation responses. BGCI will undertake a survey to determine whether the species identified as threatened are held in ex situ conservation collections as an insurance policy for the future and for reinforcing tree populations in the wild. Species currently lacking ex situ protection will be highlighted as priority species for conservation action and recommendations for their conservation will be made. Bournemouth University will guide forest restoration efforts to address anticipated changes in climate. Emphasis in conservation planning will be given to the tree species that are important for the livelihoods of local people. It is hoped that this project will lead to a collaborative publication involving participants at the workshop. Anyone with background in these forests, who is willing to contribute to this publication, is very welcome to participate.